Joining a coworking space means working alongside people who are chipping away on any number of projects or innovations. Our member spotlight series is designed to help you get to know what other Duo Works members are working on, so that you can have deeper conversations in the kitchen or maybe even collaborate on a project or two. 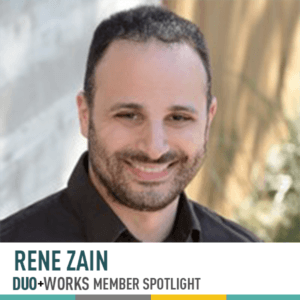 For this spotlight, it was our pleasure to interview Rene Zain. Rene Zain is the owner of Catalyst Design, a firm that handles everything from traditional print marketing collateral to e-newsletter campaigns to custom website design (full rundown). Catalyst Design specializes in building mobile responsive web presences from the ground up, powered by the ubiquitous web CMS platform, WordPress. Rene, where are you originally from, and when did you move to Austin? I’m from Brownsville, TX and I moved to Austin in 1996. After being a part of several failed startups and frustrated by the creative constraints they had placed on me, I really felt with my background in design and development I could bring about a unique skillset that could manifest into an entrepreneurial venture, specifically dealing with the web. I adopted the mantra of “Beautifying the Web” as I felt there were / are too many sites out there with rather dull and uninspired aesthetics. What’s going on with your work right now, and what are you most proud of? I’ve managed to create a steady workflow by developing multiple partnerships with various marketing outfits, especially in the medical space. The diverse and loyal clientele that I have amassed is probably what I feel proudest of. I started with a handful of clients in the real estate market and to now touch upon so many industries such as law, medical, education and more makes me feel absolutely vindicated in my original vision. What do you like most about our coworking community? The vast wealth of networking opportunities, the trading of knowledge with each other on trends and general know-how in tech, and the friendliness of all who roam the halls. If we see you in the kitchen, what should we chat with you about? Honestly, I’d probably like to learn more about one’s venture and if they have any needs for anything where either I can assist, or know of a colleague whom may fill the void. Reading: Neal Rackman’s Spin Selling. Watching: Maniac, Better Call Saul and Shop Talk. I’m also listening to many podcasts such as the Kevin Rose Show and Thought Spiral. Would you like to be featured in the next member spotlight? Click here to send us a note. Jessica Miller-Merrell, is the co-owner of Duo Works. She's recognized by Forbes as a top 50 social media influencer and is the founder of Workology. Follow her on Twitter, @jmillermerrell. © 2017 Duo Works. All Rights Reserved.